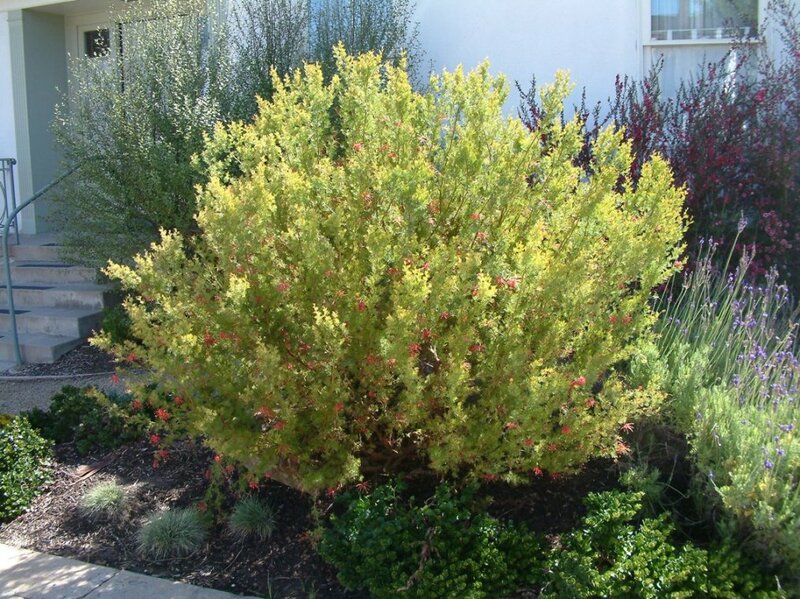 This low, compact evergreen shrub reaches 3'-6' tall and 6'8' wide. Dark pink flowers apear in the spring. Its bright green foliage is needle-like. Full sun is required for growth. Prune after bloom period to keep this shrub looking dense. Grevillea is sensitive to salt accumulation so it's important to drip irrigate for hours on this plant to leach out salt once a month. Do not fertilize with phosphates. Ruby Glow Manuka has small, needle-like, green leaves with showy, 1/2" rose-like flowers in winter and spring. These shrubs can be thinned to enhance their attractive branch structure and flaking bark. They need very little water once established. 'Ruby Glow' is compact, upright and grows 6'-8' tall by 4'-5' wide. It has dark foliage with deep red blooms; it works well as a red accent in the garden. This wonderful groundcover will grow 2' high and can be trained as an espalier. It spreads quickly to provide good cover. It blooms with white flowers followed by red or purple fruit. Thorns make it a good barrier planting.